St Andrew's Church was designed by Thomas Atkinson in 1768 in the Gothick style that he used for the palace and its gateway. When the church was demolished in 1899, the west front was left as an eyecatcher. 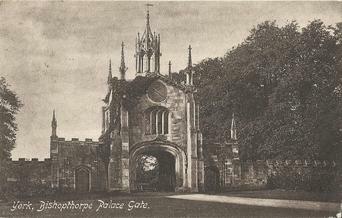 Thomas Atkinson designed the Gatehouse between 1763 and 1765 for Archbishop Robert Drummond. It incorporates a clock of 1744 in the front gable. Atkinson also designed the main façade of the palace and St Andrew's Church. The Gothick 'Strawberry Hill' style he used actually pre-dates Horace Walpole's Strawberry Hill by seven years. The open turret was added in 1895. It was re-roofed in 1978. A small round tower is in the grounds of the Archbishop of York. Between 1763 and 1769, Thomas Atkinson remodelled the palace and in the Archbishop's accounts for June 1766 he was mentioned, 'for work at the circular wall and battlements'.